(Albany, NY) – The New York Credit Union Foundation, the charitable arm of the Credit Union Association of New York, awarded $45,953 in grants to New York credit unions and credit unionists during 2012. The grants were awarded in three categories: Smart Money, Financial Fitness and Professional Development. Fifty-seven Professional Development Grants, totaling $30,092, were awarded to credit unionists from 30 different credit unions to help fund their participation in industry training sessions and education events. "Through the Foundation, we are committed to continually support New York's credit unions, their programs and the staff as they make a difference in the lives of their members and their communities," said Allison Barna, director of the Foundation. 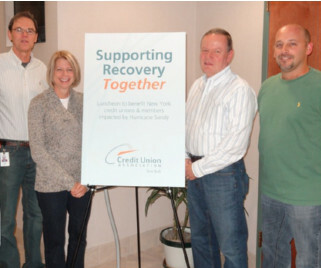 (Albany, NY) –The Credit Union Association of New York's Affiliate companies, CUC Mortgage Corporation, Covera and Universal Sharing Network (UsNet), have pledged a total of $25,000 to the New York Credit Union Foundation's statewide Disaster Relief Fund to benefit Hurricane Sandy victims. Additionally, CUNA Mutual Group is contributing $10,000. (l-r) Credit Union Association of New York President/CEO William J. Mellin with CUNA Mutual Group Sales Executive Lori M. Valentini, CUC Mortgage COO Edward Kovalefsky and UsNet COO Marc Inger at the Association’s Nov. 9 fundraising lunch. unions, credit union employees/volunteer leaders and members impacted by Hurricane Sandy. The funds raised are a tremendous show of support for New York's credit union community. "Helping comes naturally to credit union people. That inclination is even stronger when you know that an individual you have served on a committee with, hiked the hill with or attended a credit union roundtable with is the one who needs your help," said Vicki O'Neill, president/CEO of ACMG FCU and chairperson of the Foundation's board of trustees. "Occasions like this present us with the opportunity to remind ourselves of what it means to be part of a unique and meaningful movement." The Credit Union Association of New York hosted a lunch fundraiser last Friday for its staff and staff from Alloya Corporate FCU, raising nearly $1,400 for the Fund. CUNA Mutual Group was also represented at the event. Credit Union Association of New York and Alloya Corporate FCU staff participated in a fundraising lunch on Friday to benefit the Foundation’s Disaster Relief Fund. Nearly $1,400 was raised at the event. The Association matched all funds donated by Association staff through last Friday, including during the lunch event. With the match, the Association and its staff have donated nearly $6,000 to the Fund. address these challenges, the Association is committed to providing as much support as possible." 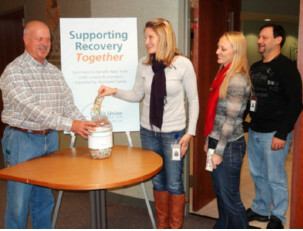 The Association and its Foundation are encouraging credit unions, individuals and system providers to donate. All donations will be used to help impacted New York credit unions and credit union employees/volunteer leaders and members who do not receive financial assistance from CUAid, the National Credit Union Foundation's disaster relief system. Those impacted are encouraged to apply for assistance. For more information or to download an application, visit the New York Credit Union Foundation website (www.nycuf.org). The New York Credit Union Foundation serves credit unions, schools and community organizations that help improve the financial independence of New Yorkers and promote the credit union difference. For more information about the Foundation, visit www.nycuf.org.